Gary Shteyngart was born in Leningrad in 1972 and came to the United States seven years later. His debut novel, The Russian Debutante’s Handbook, won the Stephen Crane Award for First Fiction and the National Jewish Book Award for Fiction. His second novel, Absurdistan, was named one of the 10 Best Books of the Year by The New York Times Book Review, as well as a best book of the year by Time, The Washington Post Book World, the San Francisco Chronicle, the Chicago Tribune, and many other publications. He has been selected as one of Granta’s Best Young American Novelists. His work has appeared in The New Yorker, Esquire, GQ, and Travel + Leisure and his books have been translated into more than twenty languages. He lives in New York City. 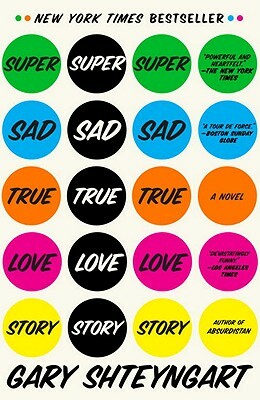 “Gary Shteyngart’s third novel, Super Sad True Love Story, had to be a total blast to write. “if Gary Shteyngart is any indication, fiction will continue to be the place where authors ponder the survival of most everything else that matters…These inventions are indicative of the book's pleasure, which is simply its effluence from a mind as smart, loony and darkly prophetic as Mr Shteyngart’s.